Since the tents were pitched just over three weeks ago, Occupy Oakland has come out of Occupy Wall Street’s shadow to assert itself as a major social movement phenomenon in its own right – as well as a major world news story. Like many other ‘Occupies’ around the country, the Oakland occupation started as an attempt to emulate the Wall Street phenomenon. Three weeks later, it is way beyond that. A crucial watershed came a week ago, when the Oakland mayor, Jean Quan, made good on her threat to evict the Occupy Oakland encampment – no doubt a major eyesore for her, sitting directly outside City Hall, on Frank Ogawa Plaza – dubbed ‘Oscar Grant Plaza’ by the Occupiers, in memory of a young man shot dead by police on the local BART subway system in 2009. The eviction of Occupy Oakland’s tent city was a tactical success, and a strategic disaster for the police and the Mayor’s office. Carried out amid a hail of tear gas and stun grenades in the early hours of Tuesday October 25th, a large troop of riot police quickly overwhelmed and laid waste to the camp, and hauled about 100 Occupiers off to jail. The Occupiers had lost their piece of prime real estate at the heart of Downtown Oakland – but were determined to take it back. By next evening, the Occupy Oakland community had – in its homelessness – somehow multiplied in size, and several thousand marched on ‘Oscar Grant Plaza’ to confront the heavily tooled-up police now ‘occupying’ the square in a very literal, and military, sense. Under fusilades of tear gas and other ‘less-lethal’ matériel, the waves of Occupiers ebbed and flowed, but the people refused to leave the streets. At the end of a long night, the police had managed to badly hurt several people. Standard fare for ‘riot’ policing, then. But embarrassingly for the police, this ‘riot’ was one-sided, with Occupiers refusing to do anything more militant than stubbornly hold their ground. Yet more embarrassingly, the most serious casualty was a 24-year old double Iraq veteran, still wearing his Marine Corps jacket and his Veterans For Peace t-shirt when a police projectile hit him at close range in the head, leaving him with serious skull and brain injuries. In the process, Occupy Oakland became a major news story, with the showdown at Oscar Grant Plaza making headlines across the country and the world. Realising their folly, the police withdrew from Downtown Oakland and Mayor Quan issued a pathetic statement aimed at appeasing the Occupiers. The camp had been razed. But on the Wednesday, two nights after the eviction, and with the police nowhere in sight, Occupy Oakland was reborn at Oscar Grant Plaza. At the Occupation’s largest General Assembly yet, almost 1,500 people voted to call a general strike for November 2nd – with only a couple of dozen voting against. A handful of voices spoke to the obstacles standing in the way of such a strike. It was noted that November 2nd was only a week away, and that Oakland hadn’t seen a general strike since 1946. And then there was the awkward fact that Occupy Oakland is in no way a labour body. But against the sense of elation, momentum and possibility attending the victory over the authorities, all these seemed minor technical details. When November 2nd came, it was – unsurprisingly – a far cry from the textbook definition of a ‘general strike’. But it was also a powerful vindication of the plot hatched a week previously. Many businesses stayed open, and many workers went to work, but Downtown Oakland was anything but business as usual. With no police to be seen, and the streets around Oscar Grant Plaza swamped with Occupiers and strikers – including in particular many teachers, students, and healthcare workers – the city looked, sounded, felt and smelled like something halfway between a liberated zone and a festival of the American oppressed. 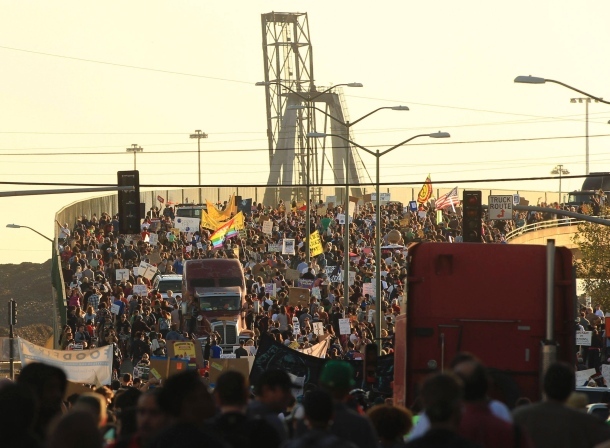 In the late afternoon, the festival became mobile, as several thousand people streamed out of the city centre to shut down the Port of Oakland – the fifth busiest in the US – with bicycle-mounted sound systems blaring Thriller-era Michael Jackson (for some reason as omnipresent at Occupy events as the Oakland Raiders chant: “Let’s go/ Oakland!”), and a full marching band in tow. The aim was to stop the evening shift change from taking place. The word was out that the longshoremen, known as labour radicals, were more than sympathetic – but that they and their union arbitrators could use all the help they could get in convincing the port authorities that Oakland would be forced to drop from fifth to least busiest US port that night. The help came in the form of a human tsunami that subsumed all entrances to the port, paralysing the big rig traffic on its way in and out. Sometime before 9pm, word got through that it was “mission accomplished” – but many Occupiers were all set to stay put and disrupt the early-morning shift changes too. The mood was a jubilant one. But like revolution, an occupation, it seems, is not a tea party, and this day of swaggering and precocious action would not be without its messy postscript – a reminder of the distance left for the Occupy movement to run, and of the very real tensions and struggles littering its path. Late in the night, a group of Occupiers took over a disused building a block from Oscar Grant Plaza – a former homeless shelter, vacated when government funding cuts made the shelter project unable to keep up its payments. Still reeling from the PR disaster of the previous week, the police were nowhere to be seen all day, and in the Olympic hide and seek stakes, could have taught Osama Bin Laden a thing or two. As soon as the building was taken, however, a force of riot cops had appeared as if by magic, and gone in like Gangbusters, breaking out once again their ‘less lethal’ cocktail of tear gas, flashbang grenades and bean-bag rounds in evicting the nascent occupation, and arresting dozens. At time of writing, the dust is still settling on this latest act in the Oakland drama. The word on the street is that the relationship between the Mayor’s office and the police is breaking down, as the authorities struggle to come up with a strategy to deal with the rising tide of dissent. But such disarray may not stop aggressive police actions as ‘red lines’ are crossed – as happened at the vacant lot in Oakland on Wednesday night. No-one can say in what direction these kinds of events might push proceedings – but as a weather vane for the Occupy movement, all eyes will be on Oakland in the coming days and weeks.